Last week, News Corp., owner of realtor.com in the U.S. and the majority owner of REA Group in Australia, announced the $210 million acquisition of lead qualification service Opcity. Why it matters: With this acquisition, realtor.com dives deeper into the lead conversion funnel in a major way. 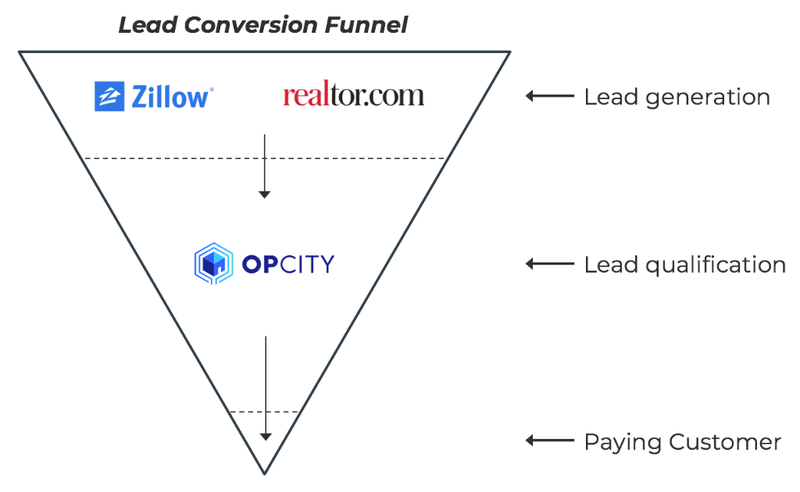 Opcity features a referral fee business model where customers are worth 36x more than a lead, which highlights why the U.S. portals are diving deeper into the funnel. Zillow and realtor.com are both lead generators. They drive traffic to their web sites, advertise real estate agents and generate leads in the form of consumers who are looking to buy a house. This is the lion’s share of their revenues and the core of their business models. The conversion of leads to actual, paying customers is left up to individual real estate agents and nominally occurs offline. But this is changing. In Zillow’s last earnings update, it shared its goal of “moving beyond lead generation and actively evolving toward being a deeper funnel real estate industry partner.” It launched a new super-charged concierge service where Zillow sales reps qualify leads before matching them with a premier agent. News Corp’s acquisition of Opcity is the same move: deeper down the funnel. Opcity takes raw leads, qualifies them and then matches them with an agent. It does not charge per lead, like Zillow or realtor.com, but charges a referral fee for any leads that turn into paying customers (typically 30 percent to 35 percent of a buyer’s agent commission). The cost per lead on Zillow ranges from $20 to $220. I estimate the average to be around $55 per lead. 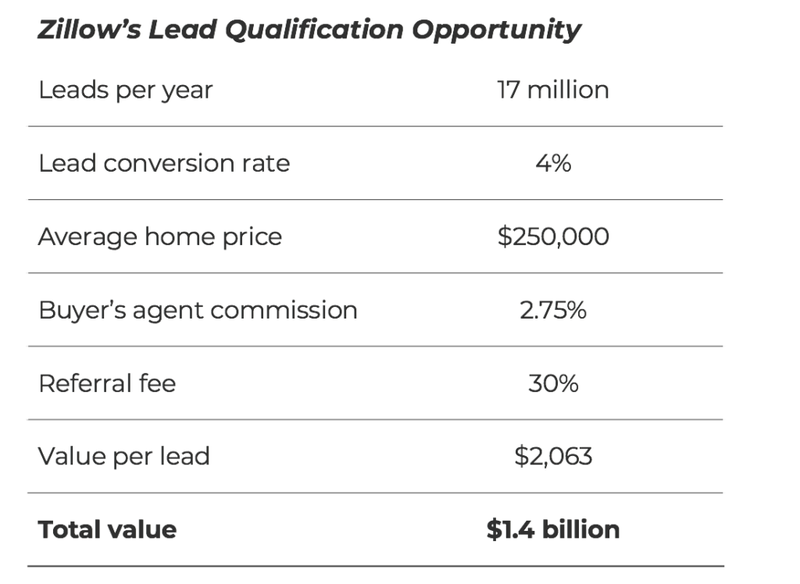 For Opcity, assuming a $250,000 home, a buyer’s agent commission of 2.75 percent, and a 30 percent referral fee, each customer is worth around $2,000 — or 36x higher than the value of a lead. In the case of both Zillow’s concierge service and Opcity, consumers are able to speak to a human being faster and are matched (not just sent) to an agent faster. Agents are matched with pre-qualified consumers, saving them time and energy. Plus the return on investment for the concierge model is far superior to simply buying leads. At first glance the Opcity and referral fee model may seem like a bad deal. Why would an agent pay 30 percent to 35 percent of their commission (around $2,000 for an average transaction) for a referral when they can buy leads for a fraction that price? It comes down to the math. 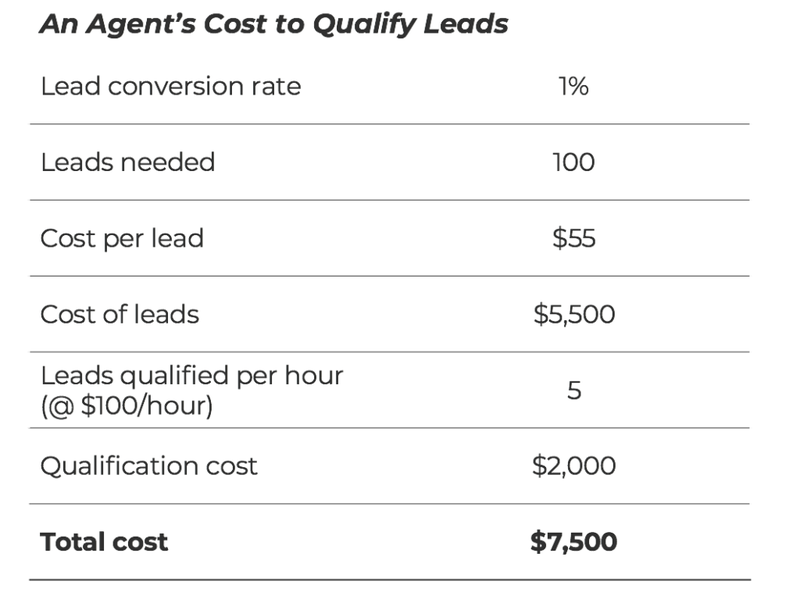 Buying leads and converting them to customers costs an agent, on average, around $7,500 per customer — compared to $2,000 for a customer through Opcity. It all comes down to the conversion rate. Operating at scale and singularly focused on doing one job, Opcity and Zillow have the scale and technology advantage to convert leads more quickly and efficiently. They have call centers, teams, data and a long list of agents if the first one contacted doesn’t answer the phone. It’s no surprise their conversion rate is higher. Back in FY16, when Zillow last reported the figure, it generated around 17 million leads during the year. If we assume Opcity’s 4 percent lead conversation rate (between 3x-5x the industry norm of 1 percent) and a 30 percent referral fee, those 17 million leads are worth $1.4 billion in revenue to Zillow (about 50 percent higher than the ~ $930 million in current premier agent revenues today). Given the industry upheaval it would create, it’s unlikely that Zillow would change its fee structure. Rather, it will likely approach the same commission rate through the existing premier agent program and share-of-voice bidding system (similar to Google AdWords). Zillow will get there in the end, but through a different path: by providing more value to agents and growing the revenue per lead. The core of this entire model is the buyer lead, which only works in markets where there are buyer’s agents. In international markets like the U.K., Australia and New Zealand — where there are only listing agents — buyer leads are not nearly as valuable. A similar lead qualification service still has merit for seller leads, when consumers are looking for a listing agent (see Homelight, OpenAgent or REA Group’s Agent Finder service). But real estate portals generate significantly fewer seller leads with a lower intent. To sum it up for portals: Pay close attention to lead qualification if you operate in a market where you can monetize buyer leads. It’s a superior experience with a big revenue opportunity. A concierge lead qualification model provides a superior experience for consumers and agents. And for agents, it delivers a superior return on investment. Real estate portals like Zillow and realtor.com can monetize qualified leads much better than raw leads. More value to agents equals more revenue. The recurring theme here, which I discuss often, is the importance of people in the process. Augmenting — not replacing — humans with technology is the winning formula. Lead conversion is important. Small teams can’t compete, but the larger platform plays (Keller Williams, Compass, etc.) can absolutely build products (technology plus people) that improve lead conversion at scale. But are they?